Queen of Hearts Classic Slot Review - Casino Answers! Queen of Hearts is a 3-reel, 4-line video slot developed by Vegas Technology. You can play the Queen of Hearts classic slot machine at Bovada. Coin values on the Queen of Hearts slot machine are $2, $3, $4, $5, $6, $7, $8, $9, $10 and $25. You can select up to 4 paylines on the Queen of Hearts slot game. You can bet anywhere from $2 per spin up to the maximum total bet of $100 per spin. For a reel slot machine such as Queen of Hearts, it has an incredible betting range that is best suited for high rollers. You can manually skill stop your spins via the “Stop Spin” button. To play Queen of Hearts, select your number of paylines with the “Bet One” button and hit “Spin” to spin the reels. You can also press the “Bet Max” button to spin the reels with all 4 paylines enabled. Casino Answers recommends that you play the maximum bet at all times to be eligible for the best payouts. The Spade and the Queen of Hearts are the two top paying symbols on the Queen of Hearts classic slot. 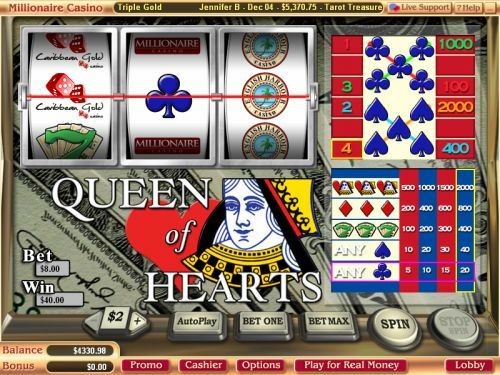 If you land 3 Queen of Heart symbols on the fourth payline, you will win the 2000 coin top jackpot. You can also win 2000 coins by landing 3 Spade symbols on the fourth payline. You can win 1000 coins by landing 3 Club symbols on the third payline. The Spade symbol only pays out on the 2nd and 4th paylines, whereas the Club symbol only pays out on the 1st and 3rd lines. Hit these jackpots to win big at Bovada! There are 7 winning combinations on the Queen of Hearts classic slot machine. The complete payout schedule is as follows (1/2/3/4 line payouts in parenthesis): any Club symbols (5/10/15/20), any Spade symbols (10/20/30/40), 3 Seven symbols (100/200/300/400), 3 Diamond symbols (200/400/600/800), 3 Queen of Heart symbols (500/1000/1500/2000), 3 Spade symbols (100/0/1000/0), 3 Club symbols (0/400/0/2000). Hit “Autoplay” to open up the Queen of Hearts autoplay mode where you can select the number of spins (5, 10, 25, 50, 100, 250 or 500) and number of seconds between spins (0.25, 0.50, 1, 1.50 and 2). Stop settings include stop once all spins are complete, stop when jackpot is won, stop if a win exceeds or equals ($50, $100, $150, $200 or $250), stop on any win and stop if credits increase/decrease by ($50, $100, $150, $200 or $250). You can cancel autoplay on the Queen of Hearts online slot at any time. Queen of Hearts is a rare 4-line slot machine with a unique payout method – payouts differing per payline. You can try this somewhat unique slot game out when you play at USA-friendly Vegas Tech casinos such as Bovada! Can players from the United States play the Queen of Hearts online slot? Yes, American players are welcome to play the Queen of Hearts slot machine at select Vegas Tech online casinos, such as Bovada. Why can’t I find the Queen of Hearts casino game at a Vegas Tech casino? This game is not found at all Vegas Tech casinos. Instead, look for it at the casinos we have listed.